Recently I had the opportunity to see a dress rehearsal of ANN which opened for previews a week ago at Lincoln Center’s Vivian Beaumont Theater. 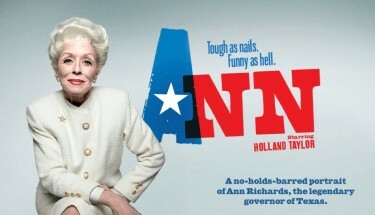 An exploration of Ann Richards, the one-woman-show was created by Holland Taylor from a compilation of speeches, interviews and discussions with people who knew the former Texas Governor. As you can see from the image above, the show is subtitled “Tough as nails. Funny as hell.” and it seems to be a perfect encapsulation of the woman herself. The play is bookended with a speech the governor is giving to a graduating class and the speech gives us an entry into and an exit out of Ms. Richards story — how her life began, how she became a mom and housewife, how she decided to get into politics, how she gave a keynote speech at the 1988 democratic convention that put her on a national stage and how she eventually became the governor of Texas. Partway through the play the set changes and we get a glimpse of Ann in her governor’s office, conducting the business of running the second largest state in the country. Even if you don’t care for politics, this show is something you should see. I am not a particularly political person – don’t get me wrong, I have a political point of view and (honestly) very strong opinions about the political scene in this country but, beyond the occasional Facebook post, I don’t usually have much to say about the political world. The whole thing gives me a headache and makes me tired at the same time, so I usually don’t wade into that morass. And, when considering seeing ANN, my immediate reaction was that I didn’t really care about politics so why would I want to see a show all about politics. What’s more, going in to the play, I knew very little about Ann Richards beyond that she was a former governor of Texas. And, although I have always liked Holland Taylor, my experience of her as an actress has always been enjoyable but limited to the strong but supporting roles in movies and television that she has gravitated to. Basically, I had no idea if the subject matter would be particularly interesting or enlightening or entertaining and I had no idea if the actress/playwright would be able to carry the execution of an entire solo show…It turns out, an all counts, I shouldn’t have worried, I was in expert hands. ANN is hilarious and touching, moving and fascinating. I was impressed with many things about the show — Ms. Taylor’s impeccable timing, her grace and her intelligence which shone clearly in her performance, but what really impressed me was the sense I got of Ann Richards as a woman — a funny, intelligent, balls-to-the-wall woman. Watching her have conversations with her secretary (an off stage presence you never see but instead hear through the phone’s intercom), various people on the phone (ranging from dignitaries like Bill Clinton, to her staff, to her children) and even herself, we see a woman who barrels through and gets the job done. She is a woman who is confident, sharp and witty, fiercely intelligent and in control, even when she’s not. And she’s one of those women who, as a woman watching, you want to be like. I can see why Ms. Taylor was drawn to her subject matter. Ann Richards was someone who was extremely capable, full of love for her children, her job, and her country. She devoted her life to public service and we were all the better for having had her in the world. As a woman with a theater company dedicated to giving more opportunities to women, I am drawn to strong women, as characters and as people. So it is no surprise that watching ANN, I to was drawn to Ann. I found myself wanting to be like her a bit more in my life. Don’t get me wrong, I’m a pretty confident, sharp and witty, intelligent and in control woman myself; but, watching the play you can’t help but want to be that confident and that capable all the time. To the point that you don’t care what people think of you as long as you gets the job done and done right. Ann Richards clearly had a strong personality but she also clearly had a strong moral center and a clear idea of what needed doing and how to get it done. And though I’m sure there were times when that confidence and competence pushed the scale towards difficult and maybe even unlikable to the people around her, it’s clear from the play that she never wavered in who she was. I wished I had known her while she lived and I’m honored that I got to know her through this show. Holland Taylor gives an extraordinary performance that brings the audience in and lets us all get to know Ann Richards a little better. Don’t miss your chance to meet and spend some time with these extraordinary women. Posted on February 28, 2013 by gttpftp. This entry was posted in NYC Life, NYC Theater, Reviews and tagged NYC Theater, Review. Bookmark the permalink.